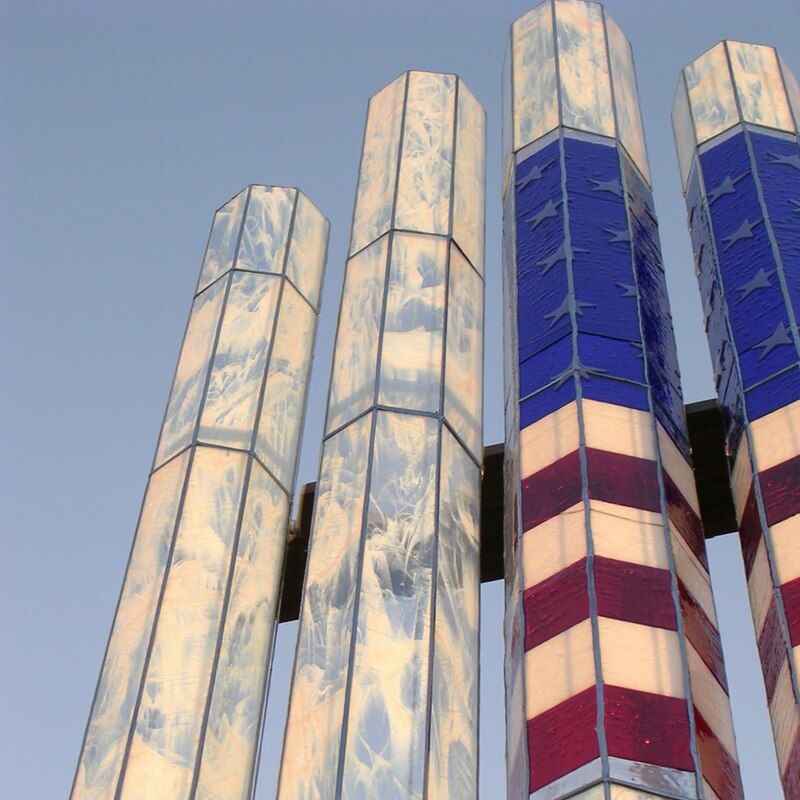 In response to the tragic terrorist attack of September 11th, 2001, Xaver Wilhelmy began research and development to create organ pipes from glass. "I thought, one ought to remember the life. 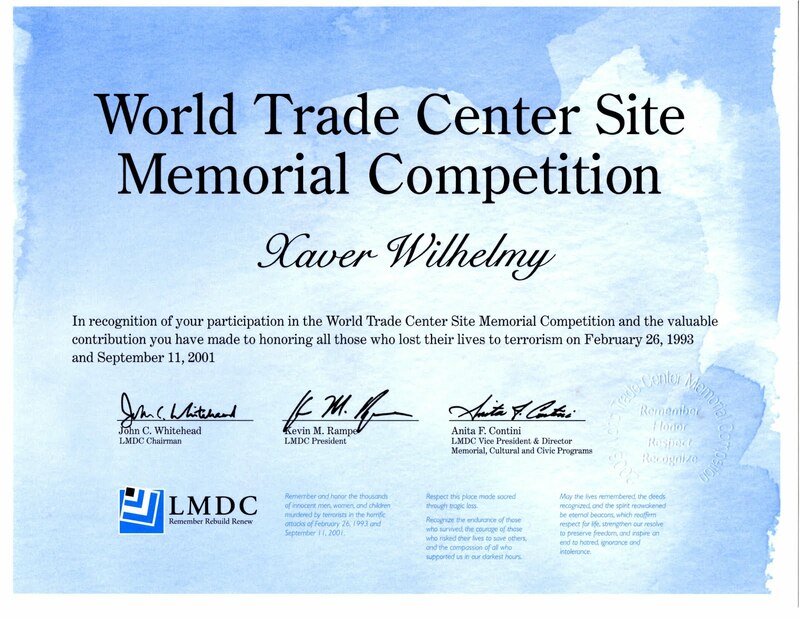 One ought to remember the interaction, the voices of people," said Xaver Wilhelmy. “Life is better remembered in a musical instrument, as opposed to a memorial that is mostly stone.” In fact, this sound sculpture was the basis for a proposed Ground Zero monument that would have included more than 3,000 pipes - one for each person lost. The thought was to make each pipe uniquely beautiful, each with it's own voice, and to dedicate each glass organ pipe to one of the individuals lost. While the site plan never came to fruition, this instrument remains a voice for those silenced that fateful day. Having had the good fortune of completing an apprenticeship in pipe organ building at Rieger-Orgelbau under Caspar Glatter-Goetz some 30 years ago, the encouragement at Rieger to be creative and scientifically sound has stayed with me all those years. 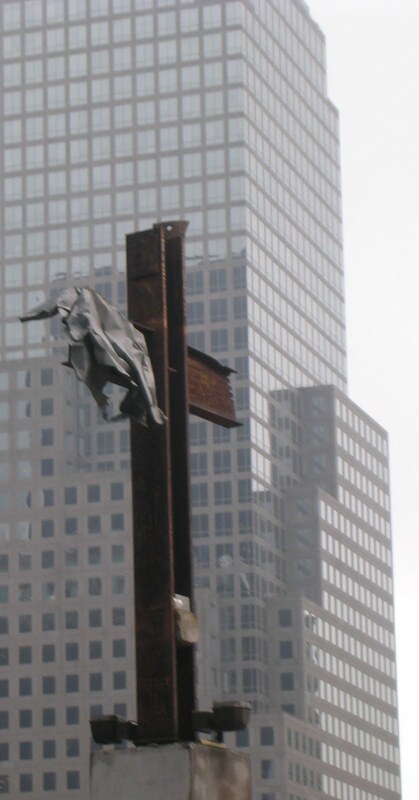 So, after those outrageous attacks on civilian lives of 96 nations on September 11th, 2001, my mind was occupied as to how one could possibly remember the sudden loss of so many people. With those heinous acts all the interaction of their individual characters, voices, strengths, and delicate nuances stopped. Would these people be memorialized with granite, chiseled name lists, and running water, like so many memorials of recent history? New York City has always had a special place in my heart, since I worked there for Rieger several months in the mid-eighties, and the field in Pennsylvania, where the one aircraft was brought down by its courageous passengers, as well as the Pentagon building I also have heart-connections to. Remember the voices. 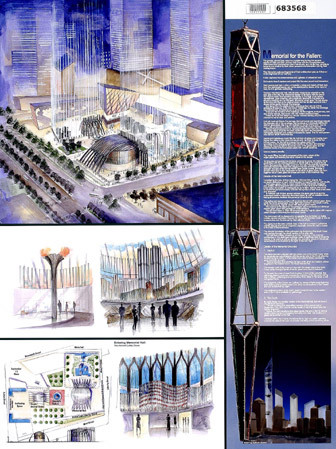 Create strikingly beautiful glass organ pipes with never-repeating patterns and details of all pitches to complete a 48 stop pipe organ (which would have around 3,000 pipes - one for each life lost) within a circular, glass-domed concert-memorial hall of intimate size, about 24 meters diameter. Here, the voices and individual characters of the victims could be remembered in musical interaction, visual beauty, and meaningful architectural harmony. Due to the predominance of glass, any visitor would be exposed to an ever-changing display, governed by the external weather and time of day of the visit. With today's technology, the instrument could be played 24/7 via the internet by musicians around the world - bringing the 96 nations together, whose citizens were amongst those killed. Organ pipes have their components named after human anatomy, like "foot, body, ear, beard, mouth," etc., so to dedicate one pipe to a single person was a natural thought. In January of 2002, I started making the first prototypes, adjusted their voicing, and smoothed out the production process for about half a year. By October of 2002 it became apparent, that we needed to create a set of glass pipes, that could demonstrate the beginning of design possibilities. With the attacks having been made on U.S. soil, I decided to let the American Flag "wave" across this 14-pipe facade, with the image effortlessly alternating between the front and the back of the pipes. This set is based on a Principal 8', 150mm diameter low C, with a nice German "Strich", and it has tuning devices in glass fitted as well. It is voiced at 80mm, but we found it to create also a very warm cello sound at a wind-pressure as low as 58mm, which was used for a youtube video demonstration. It took us 18 months to complete this set by June of 2004, and at times, I and my six employees worked full time on this project. 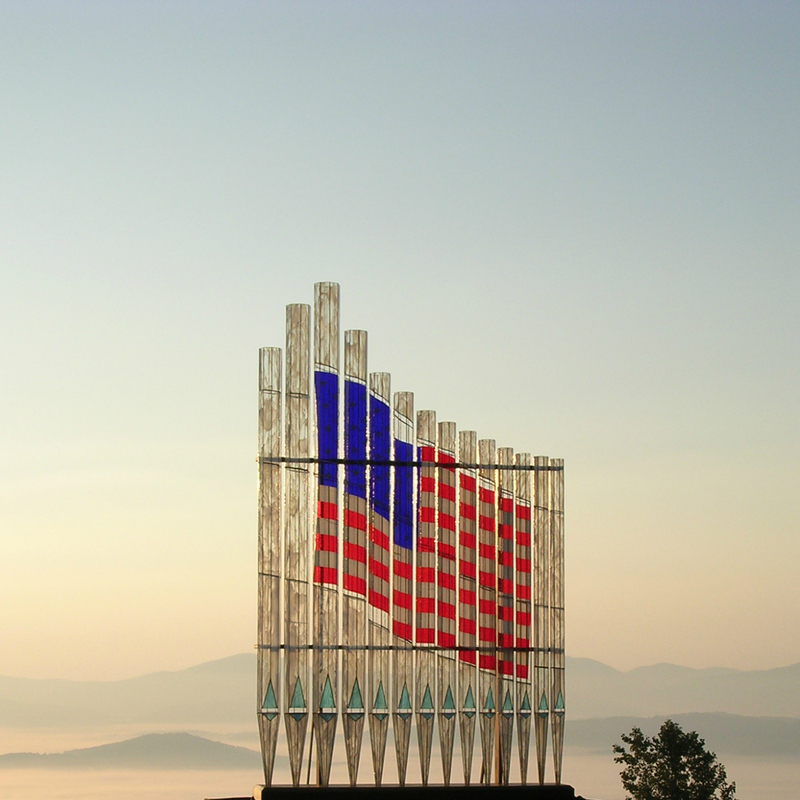 The glass is hand cast in Washington and Oregon State, with the image of the American Flag being followed "to a T" and fused in a glass kiln we had custom made for that purpose. To give the image "life", we not only gave the left edge a gentle arch, but its size diminishes by 7% from left to right, with all stars diminishing in size as well as the stripes to maintain a pleasing optical proportion. The right edge playfully wraps around the third to last pipe on the right towards the front. We also designed and built a Trumpet 8' and Clarion 4' division with the resonators from Low C to tenor e being of copper and glass, with the rest of the notes being made of all glass, tapered and round. The windchest feeding these innovative, "cut to length" glass trumpet pipes houses almost more innovations itself, than one can find in the pipes. With the introduction of glass in pipe making, the choices for organ fronts don't have to be silver, gold, or wood anymore, but anything your imagination allows! From fresh colours, via chameleon-like blending with textures and colours found within the architectural setting, all the way to total translucency the possibilities of integration of the contemporary pipe organ is limitless.